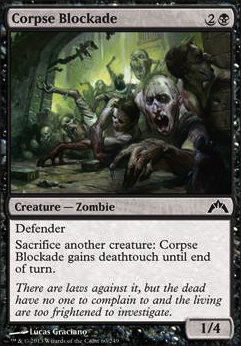 Defender Sacrifice another creature: Corpse Blockade gains deathtouch until end of turn. 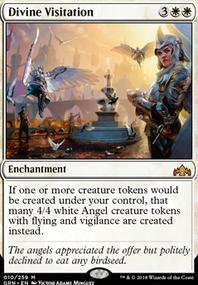 Perhaps make room for more creatures, including Undead Alchemist, something like Vampiric Rites for card draw off of tokens, and, say, 4 or 5 fewer Island swapped out for 4 or 5 more Swamp or UB lands. Also, if you can include a few more sac outlets like Nantuko Husk (maybe with a Rogue's Passage + Tainted Strike), Carrion Feeder, Corpse Blockade, or Phyrexian Ghoul, then Living Death or Living End become possibilities. If you really want to go the 'drain life' route, why not play Plague Belcher, Diregraf Captain and Geralf's Messenger? Viscera Seer is a much better sac outlet than Corpse Blockade, although not a Zombie. Diregraf Ghoul and Unbreathing Horde are probably quite underwhelming, and should be dropped, together with Zulaport Cutthroat (as mentioned above, there are better drain options that are actually Zombies). 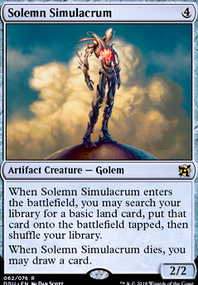 Also, Ghoulcaller Gisa is not legal in Modern not because it was banned, but because it was printed in a Commander set (and anyway I don't think you want to play 5 drops with only 20 lands, even with the Bontu's Monument). 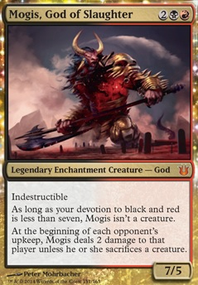 I'm sure you have your own reasoning, but generally most people would take out Corpse Blockade for Geralf's Messenger, though your deserts would make it harder to cast, if i were to do a zombie deck for myself, it would be Black Devotion with Nytkthos, Sidisi, Undead Vizier and the warchief. But I like the mummy-desert feel yours has. I'm not a huge fan of the Altar of Dementia. Granted, it's your kill condition and it's a sac outlet, but you can likely accomplish this another way. Corpse Blockade, Carrion Feeder, Nantuko Husk, and Phyrexian Ghoul all count as sac outlets (and you could argue that the latter three could be game winners as a result). 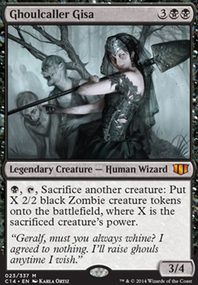 The diregraf captain works as your win condition in this regard and you can stay on theme with zombies. For that matter Gnawing Zombie also works, but his sac ability requires an activation cost so you can't really go infinite. In the above example, some combination of Diregraf Captain, Vengeful Dead, & Plague Belcher all work as win conditions for that matter. I presume that "forget" is a way to dump Haakon into your graveyard and not something you really intend to play on the opponent. In that case, maybe consider a card that has additional use like Forbid or Rites of Refusal instead. That way you get a little more utility out of the card (in countering a spell) and also get Haakon in the 'yard. For that matter, you could also stay on theme with Zombies and use Cryptbreaker, Necromancer's Stockpile, Skirk Ridge Exhumer, or even Zombie Infestation. The first two are the strongest options as they also help filter your deck to get to the cards you want. They can also make use of excess lands you may draw throughout the game. I like the deck overall though. Nifty idea. I don't particularly like Returned Phalanx. In an aggressive Zombie deck like this, you don't really want Defender unless it's something like Corpse Blockade, which may actually be decent as a 2-of or so here. Don't forget that you still want to get Zombies into your graveyard so you can actually cast Skaab Goliath (and because it's a bit difficult to cast, keep it at like... a 3-of?). Carrion Feeder and Plague Belcher from the new set may help with that. I see a lot of decks like this use Grimgrin, Corpse-Born and sometimes Blood Artist, and Grimgrin may be a better option than Goliath. Something to consider. I don't know how much of a budget you have, but Gravecrawler is a fun Zombie to have. Unless they're exiled they just keep coming back. Unbreathing Horde is fun too. Would Smallpox work here? Maybe. Just maybe. Regardless you may want some removal here. Tragic Slip could work, as could Bone Splinters. I would replace Geralf's Masterpiece for Advanced Stitchwing just cause hes easier to get back is still a flier and doesnt get smaller. Monastery Siege for Ancient Excavation so you can draw a bunch and discard a bunch, this helps with your commander getting some Z's in the grave. I'd also replace Victimize and Buried Alive with Whispering Madness and Day's Undoing. Dark Salvation for Necromantic Selection with all the new wheel affects you should be able to grab something good and its another board wipe. Maalfeld Twins for Overseer of the Damned just because hes super impactfu, a flier makes Z's and kills something when it comes out. Scourge of Nel Toth for Call to the Grave cause sacrifice is really good especially against voltron commander damage decks. Raving Dead for Phyrexian Delver. Wight of Precinct Six for Shepherd of Rot. Entomb for Graf Harvest purely for the menace, butyou could use the other abilitly in a pinch if your commander gets killed to much. Necrogen Mists for Windfall, again just so you get card draw and are still forcing people to discard. Epiphany at the Drownyard for Grave Pact. 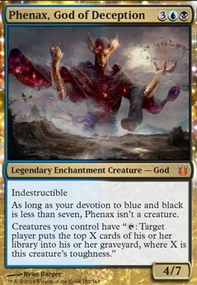 and to be sure you can get your value from cards like this id nix Nim Deathmantle for Ashnod's Altar. Geralf's Messenger is slow and 2 life wont do too much so id put in Nantuko Husk or Corpse Blockade for more sac outlets.